Warner Bros. provided me with a swag pack to facilitate this post. The opinions I share are my own. Next Friday you can see the iconic girl detective, Nancy Drew in theaters. We have a history with Nancy Drew. We read the books to Eva early on when she was around 5 or 6. When we moved into our house the woman who lived her had a collection of old Nancy Drew books. She left them for Eva. We’ve also played some only games that helped Eva learn to read. We love Nancy Drew in our house. So, I am looking forward to seeing this movie with Eva when it comes out on March 15th. You can see the trailer below. Nancy Drew and the Hidden Staircase is an all-new film coming to theaters on March 15 from Warner Bros., Ellen DeGeneres’ A Very Good Production and Red 56. This is an all-new feature length film that will keep you guessing until the very end! 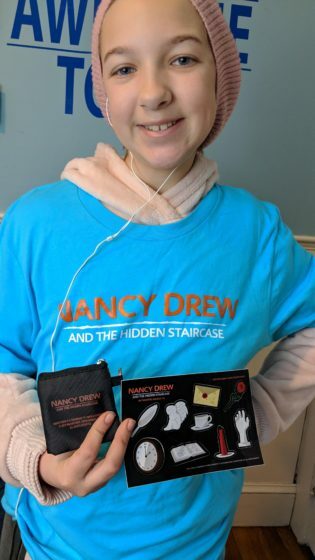 We received a Nancy Drew Swag pack that included. Occasionally publishers send me books to read and review. The thing is, I am terrible about getting them done and posting them, however that ends now. 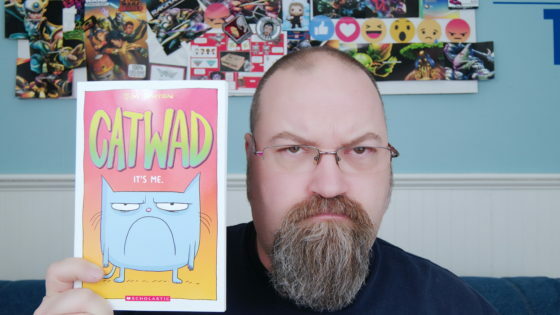 With my first review of a new book by Jim Benton called CATWAD : It’s Me. It was sent to me for free to read and review. Opinions are my own. If I can get my son to read anything it is a miracle. He likes some things but pulling him away from the iPad is often a chore. I gave him my copy of CATWAD by Jim Benton and he immediately took to it and began reading, and laughing. Belly laughs. He loves silliness and this book is right in his wheelhouse. The book is also in the wheelhouse for Andrew’s age group. I read through the book and enjoyed it. There were some moments of laughter for me but I am a bit far removed from the target audience by several years. I did enjoy it though. I especially liked the first sketch between Catwad and his best friend Blurmp. That defines their relationship immediately and lets the reader know the dynamic going forward. You can see more of what I thought in my video review below.